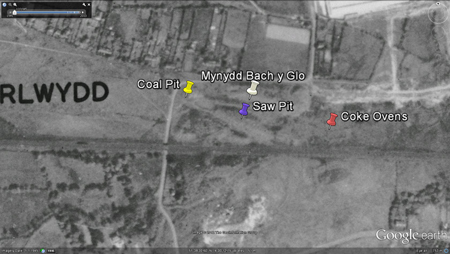 Mynydd bach y glo colliery was situated alongside Ystrad Road and the Railway at Waunarlwydd. "Mynydd Bach y Glo" meaning "Small Mountain Coal" source Google Translate. <D/D NAI/M/579/1> Connecting rod and sampling crank. <D/D NAI/M/142> Sketch of piston. THE COLLIERS OF THE SWANSEA. Colliery owned by W.P. Struve and Company. (C) K81 SOCIAL, SOCIAL DISCOURSE, etc. 1859 Mar. 11 Swansea Police Court: Ann Lewis-V-Leyshon Mathews, collier Mynydd Bach y Glo (affiliation). (C) K81 SOCIAL, SOCIAL DISCOURSE, etc. 1859 Mar. 11 Swansea Police: Ann Evans-V-Thomas Jones collier, Mynydd Bach y Glo - affiliation case. (C) F56 DISASTERS AND ACCIDENTS, etc. 1859 June 10 Man killed at Mynydd Bach y Glo colliery witness - David Evans. The Colliery was working the Six-Feet seam. (C) E20 SHIPS AND SHIPPING, etc. 1864 July 01 T.Glasbrook Jun., Shipping agents for Gorse Colliery & Mynydd-Bach-y-Glo. P2. (C) F56 DISASTERS AND ACCIDENTS, etc. 1865 Sept. 08 Inquest Re John Mainwaring,14, run over by wagons,Mynydd-Bach-y-Glo. P5. (C) J20 MINING AND INDUSTRY, etc. 1866 Jan. 05 Coal Shipping Agents: For Mynydd-Bach-y-Glo, A. Sterry; for Neath Abbey Coal Co. M.Jones & Bro. (C) J21 MINING AND INDUSTRY, etc. 1866 Feb. 02 Advert: Fowler's Patent Clip Pulley may be seen at A.Sterry's Colliery, Mynydd-Bach-y-Glo. (C) E20 SHIPS AND SHIPPING, etc. 1868 Jan. 03 Shipping Agents (Coal): T.Glasbrook Jnr - Gorse Colliery; A. Sterry-Mynydd-Bach-y-Glo.P2. Colliery owned by Alfred Sterry. (C) J20 MINING AND INDUSTRY, etc. 1869 Jan. 01 Broadoak Colliery Co: Shipping Agents - J.Banfield & Co., Mynydd-Bach-y-Glo, A.Sterry, etc. Owned by Landore Tin Plate Company with W.Davies was the manager. 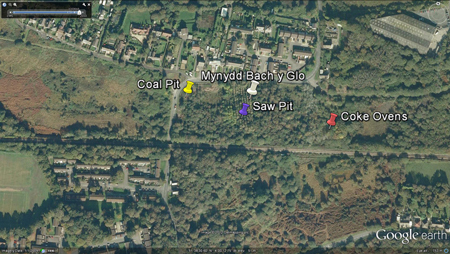 Showing colliery, Coal Pit, Saw Pit and Coke Ovens, with road access from Ystrad Road. Showing colliery and Coal Pit. THE COLLIERS OF THE SWANSEA.. The colliery abandoned the Five Foot seam before this year. Owned by the Mynydd-bach-y-glo Colliery Company of Swansea and employed 12/2 men. The colliery produced manufacturing and house coals. The Four-Feet seam was abandoned. Mynydd-bach-y-glo Colliery (Disused) old workings (between railway line and Ystrad Road). Mynydd-bach-y-glo Colliery (Disused) old workings. The Mynydd Bach slant, Owned by W.D. Thomas of Upper Cwmtwrch and employed 6/3 men. Abandoned Penscallen seam in March. It abandoned the Penscallen seam. (WGAS) West Glamorgan Archive Service - D/D NAI: Neath Abbey Ironworks Collection, part 4: plans of machinery (section 3). Workers: e.g. 355 /61 = 355 underground and 61 on the surface. The names of collieries would often change with ownership or re-openings, the coal seam name would sometimes follow suit. request for a report of Mynydd Bach-y-Glo Colliery. power for winding owing to the very steep inclination of the slant. months, in all say 14 months. Bach-y-Glo and Fforest-fach which has already been reported to Mr. Powell. across the level Icourse towards the river. from any part. It is difficult to understand the fault, as the anticlinal runs from the. proved in the Waunarlwydd Old Pit 60 years ago. some say it is the 4 ft. Seam, others say it is the 5 ft. Seam, but I say it is the 4 ft.
Ystrad can be done by contract in about 21 months after the new pit is ready. The Pit can be commenced by a wind.
" Mynydd Bach Y Glo" & "Mynydd-Bach-Y-Glo"was used to filter the Cambrian index as best as possible with the information available, 23.05.2012. Thank you to the City & County of Swansea for all your help and support.